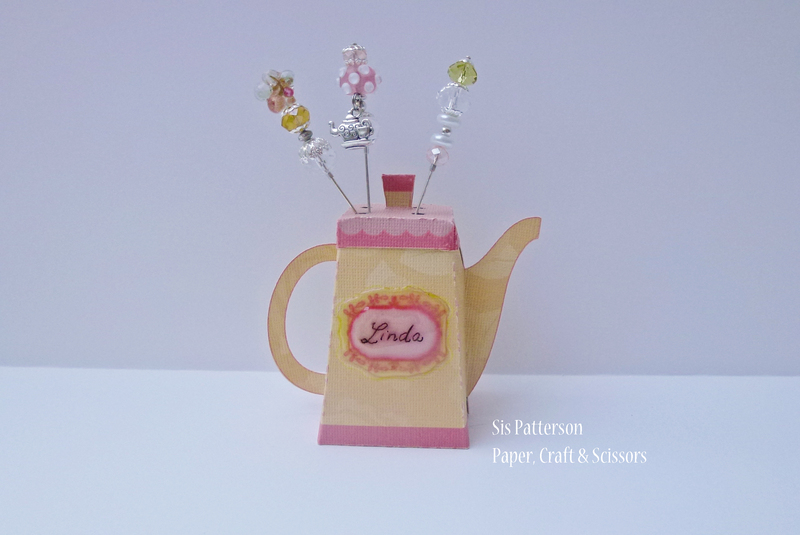 First, a paper teapot with a 1/4 inch foam insert to hold stick pins. Using Silhouette Designer Studio, I added four small holes in the lid to accommodate pins without piercing the lid. You can put up to 3 or 4 pins per hole. The teapot is from Lettering Delights, and I sized it so the two pieces of the pot and the lid would fit on a 8.5 by 11 inch piece of paper. The completed teapot measures 3″ tall and 1.5″ wide at the mouth of the teapot. The foam insert measures 6″ long. I folded it in half (to make an upside down “U”) and secured the “feet” with ScorPal tape to the bottom of the pot. I then cut a 1″ square of foam and adhered that to the top of the foam “U”. The patterned fill is also from Lettering Delights (Jolly Good Time). I know Linda is expecting some more stick pins soon but I had to include three to start off her collection. I also made a sliding gift card holder and added the teapot set (as a Glossy Accent embellishment) from Jolly Good Time. This gift set is adorable! And the pins are just wonderful! I think I will be checking out Lettering Delights. What a cute project! I’m sure Linda will love her prize. What a great idea! I’m thinking Linda will be over the moon with her prize package because it’s simply awesome :D.
Those stick pins are gorgeous btw. What a great way for Linda to display her stick pins! Fantastic idea and I think she will love her prize!! This is such a fabulous idea, I absolutely love it! Like this set! A great prize. This is just fabulous! Waht a super prize! 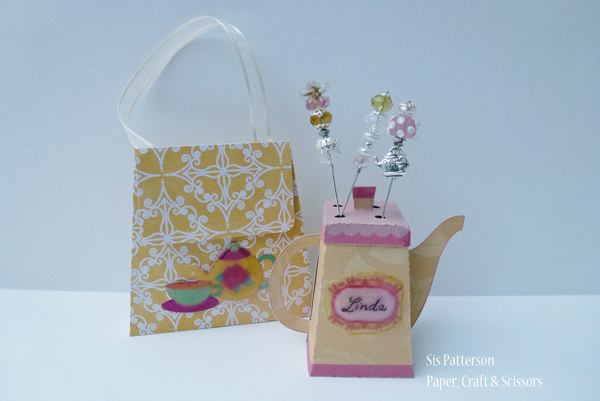 what an adorable gift set the stick pin tea pot is super fun..